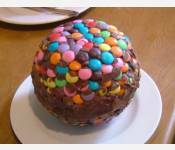 After deciding to make a giant Toffifee we had to wait couple of weeks until we could actually make the pimp. 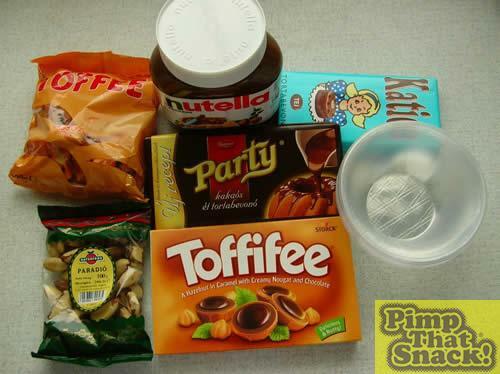 Every day was a stress, checking the website for the new pimps hoping that Toffifee was not included. So let’s hope this is the first enormous Toffifee. The most difficult thing was to find the perfect template for the toffee base. The obvious first choice would be a cereal bowl which we tried, of course. 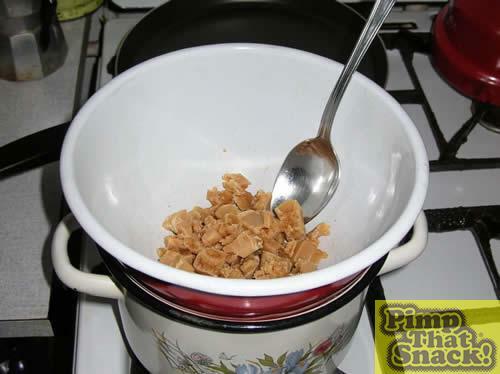 But – not so surprisingly – the toffee was too sticky to come out from the bowl. Couple of other trials with similar tools ended up in the same messy and sticky hands and toffee covered kitchen. So at the very beginning, the project came to a crisis. But the solution arrived soon in a cheap shop (equivalent to Poundland) where we found these plastic bowls. First problem solved. So once we had ready all we needed we started with melting the toffee. It wasn’t as smooth as in other previous pimping projects. It was annoyingly lumpy which makes us think that Western European toffee must be different from Eastern European ones. 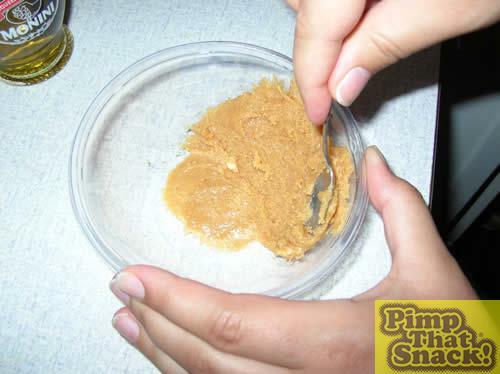 Anyway there was no other choice so we spread the melted toffee on the wall of the plastic bowl. 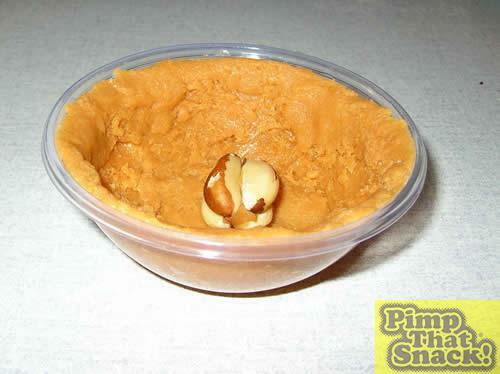 To fake a giant hazelnut we stuck together four brasil nuts with some spare melted toffee. Then we placed them in the middle of the toffee bowl and they all went into the fridge for an hour. 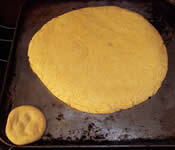 In the meantime we prepared the chocolate disc for the top. 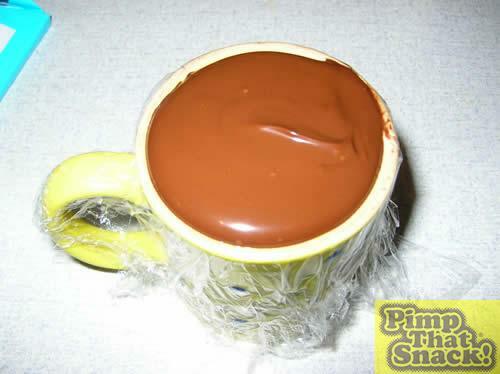 The bottom of a mug was used for making a round shape from the melted dark chocolate. This followed the toffee into the fridge. 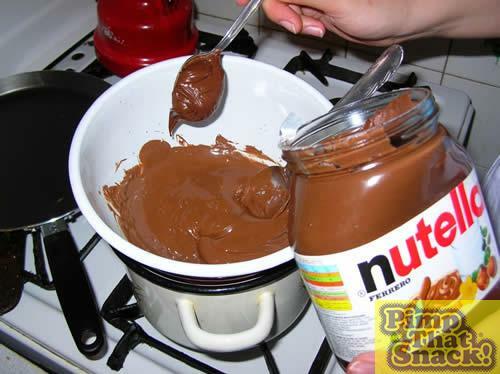 To make the cream filling we melted milk baking chocolate and mixed it with some Nutella to give the hazelnut taste.